CRIME, GUNS, AND VIDEOTAPE: Orange County Sheriff Sandra Hutchens Needs To Resign Now. Orange County Sheriff Sandra Hutchens Needs To Resign Now. Orange County, CA—The Board of Supervisors meeting was filled with an over capacity crowd as the newly appointed Sheriff, Sandra Hutchens explained her position revoking and not issuing concealed weapons permits to qualified citizens. Hutchens demonstrated an attitude that made light of the rights and needs of people requesting the ability to protect themselves and families. Strong evidence of that disrespect was revealed with the release of numerous insulting text messages sent between the hand-picked, high ranking deputies she sent to fight attempts to get Hutchens to take a more measured approach to the permit policy at the last board meeting. Hutchens informed 423, out of 999 concealed weapon permit holders of her intent to revoke their permits unless they could prove their need for protection would satisfy new demands by the Sheriff. Board members, Chris Norby and Janet Nguyen suggested that sending the notices was a form coercion designed to cause permit holder to abandon their rights and needs for the permits. Hutches sent a heavy handed force of deputies to intimidate and humiliate people who came to monitor board action at the last meeting. Additionaly it was learned that deputies took control of surveillance cameras to spy on board member’s personal notes. Hutchens’ gun-rights hatred may be appreciated in San Francisco or Los Angeles but is not welcome in Conservative Orange County. She’d never be elected as Sheriff now and her short tenure should come to an unceremonious and quick end. Numerous speakers called for a no-confidence vote of Hutchens by board members and called for the Sheriff’s resignation. Hutchens apologized for the” unprofessional text messages.” That is much too little, too late to resurrect the embattled Sheriff’s image. It’s time for Hutchens to enjoy her retirement and to quit enabling violent criminals by disarming trained and vetted civilians who have the right to self-defense. Sheriff Sandra Hutchens is dead wrong for Orange County, California. Trying to hang on to her job will not avoid the inevitable. 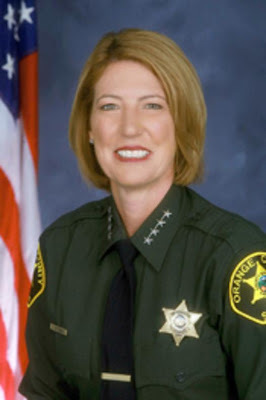 Orange County’s Conservative voters that never voted for the appointed Sheriff in the first place will oust her at first opportunity. I bet she has little or no actual street patrol experience, but was promoted to fill quotas for women and minorities in the dept. She is an elitist that thinks only the gov't should have firearms and the common person should rely on the govt to take care of them. She just does not get it. She has lots of history abusing citizens rights to keep and bear arms. She needs to go! Sandra, the burglars, rapists and killers the prisons will soon be dumpping on the streets love you. Yow will insure safe working conditions for them! I'd target the board members that abppointed this troll for defeat in the next election. If they like LA and San Francisco they should run for office there. I never trust a Sheriff or police chief that feels their ego needs to be massaged by wearing four star general insignia. These fools apparently don't listen to their oath when they are taking it, especially the part where they swear to uphold the US Constitution. Hey Sheriff Sandra, that includes the 2nd Amendment!! The Sheriff in Dallas county, Texas, Lopez, is a 5'3" redhaired hispanic lesbian. Who has little street experience. ¿So what is one to do. Moved out of Illinois for the same small minded thinking. Took the company and the jobs with me their loss. Orange County is being watched by the rest of the country and it isnt coming off as a good place to live. No one wants to be where the criminals have the advantage and law enforcemnet focuses on law abiding citizens. I gues dealing with criminals is too scary so lets spend our time harassing the good people. Move to Orange County and run against her, Paul. No, I'm serious. Check the O.C. weather forecast versus Chicago, for one. Currently 56 degrees, going down to 44 overnight. CHicago's 34, goind down to 23. It's a conservative county, versus Chicago. Blogging's good anywhere, but it's better when you're sitting outside. I dont know if she's ugly, but she definetly looks like a liberal..